Increasing your website’s traffic is fairly easy if you understand few rules of SEO. And that’s why we are here today. One of the biggest concern for any webmaster (owner of a website) is traffic, more so how to increase the traffic coming to the website. As a beginner in the online space, this might also be your biggest concern. Many sites fail because the site owners never found a way to generate consistent traffic. One truth you have to accept is that traffic is the key to success. More traffic can mean more business exposure and thus more sales. Many platforms including Google and Facebook allow users to pay to have their content shown to other users on their sites. It’s an effective method to generate traffic quickly, but it can be expensive as well. It also requires some knowledge on ads optimization which many beginners lack. Social media sites like Facebook, Instagram and Pinterest are great methods to generate traffic to your website. These platforms can be a great source for consistent traffic in the long run. The problem with this method is, the traffic you might get depends on the number of fans you have. It can take some time to generate a huge enough following that can provide you with consistent traffic. This is also not to mention any change in policy/algorithm(s) from the platform(s) could kill traffic to your site. A good example is Facebook who changed the algorithm a few years back. This change effectively killed the use of pages as fewer followers are now able to see posts from pages they follow. SEO stands for Search Engine Optimization and it’s what we’re going to be talking about today. SEO is one of the most consistent ways of generating traffic to your website if done right. This technique can simply be defined as the use of certain methods to rank higher on Google’s search results page. It can take some time to achieve this depending on your industry, but it’s worth it in the long run. All the methods mentioned above can help increase traffic, but the one that we always advise beginners to use is SEO. This is because it provides consistent results and is not expensive to do. 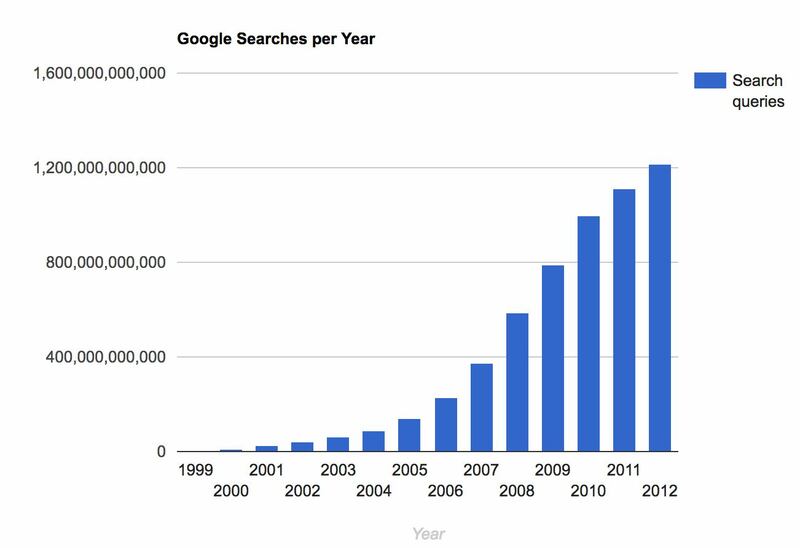 This is a simple graph that shows how Google searches per year have been increasing very rapidly. SEO is your key to getting more traffic to your website. This is because Google’s search engine gets quite a number of visitors each day. If you play your cards right, you can get a huge chunk of these visitors as traffic to your website. To achieve great results with this method, there are some principles that you’ll have to follow, which we cover later on. You need to understand that Search Engine Optimization (SEO) is a long game. Don’t expect instantaneous results, you will be disappointed! Now that we have looked at the basics, you should dive deeper into this guide to gain a better understanding of SEO and how you can leverage Google to gain more traffic. As a beginner, SEO can be daunting and difficult to understand. It’s a term that you hear often, but see differing opinions on how to properly implement. You are probably suffering from information overload as you read this. We sympathize with that. There is a lot of conflicting information out there about SEO. This is magnified by the many gurus in the industry. One person you follow could advise one method and the other expert may completely dismiss it, leaving you confused. It’s due to this that we chose to simply provide an easy to digest guide that covers all the basics. Let’s have a look at a few terms before going into the more crucial elements of SEO. Traffic – These are visitors that land on your website. Traffic can be paid or organic. Paid traffic is visitors that landed on your website via ads you had to pay for. Webmaster – This is simply the owner of a website. You are a webmaster if you own and manage a site online. Search Query – This can be defined as the words that the user types into a search box. For instance, if you typed “What is SEO?” into the Google search box, that is a query. Keyword – Wordstream defines SEO Keywords as “keywords and phrases in your content that makes it possible for people to find your site via search engines”. Search Engines – As defined by Wikipedia “Are software systems that are designed to search for information on the World Wide Web”. The term “search engines” is mostly used to refer to systems like Google, Bing, Yandex, and Yahoo. Many webmasters tend to focus their efforts on Google as it’s the most popular and gets the most visits of the 3. Search Engine Results Page (SERP) – These are the result pages that are displayed on the search engines after a query is typed in. The SERPs show you the website that can provide an answer/information related to your query. Backlinks – This can be defined as when a website links to your site on their page. For instance, you have site A and there’s another person that has site B. When the owner of site B adds a link to his post that points to your site (website A) that is considered a backlink for you. Indexing – Is the process of adding web pages to Google. It’s normally an automatic process that happens over time. 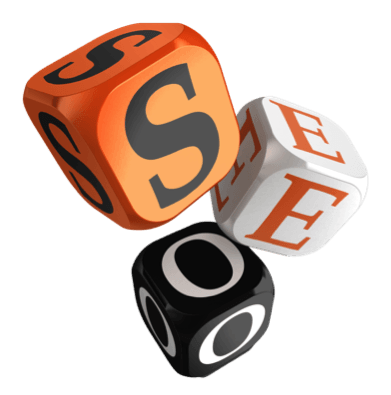 SEO – This stands for Search Engine Optimization. It’s a method that webmasters use to show the quality of their website to search engines. The main aim is to increase rankings on the search result page. 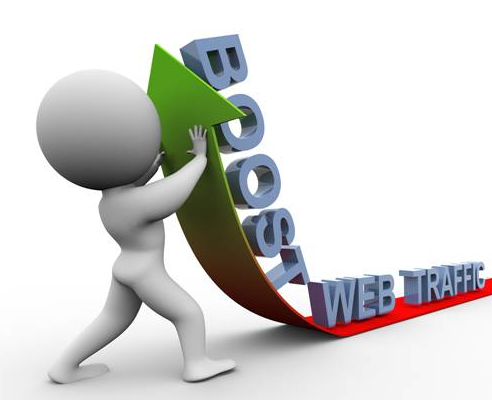 It’s a method used to bring organic traffic to a website via increased visibility on the search engines. Now that we have defined the basics, let’s have a look at why you should use SEO on your website. Why do you need to focus on SEO for long-term benefits instead of focusing on paid ads & social media marketing? As we recalled earlier, there are many different methods to increase traffic to your website, so why stick to Search Engine Optimization? Why should we put all our efforts on getting traffic from these search engines? The answer is simple, targeted traffic. Search engines are not only your biggest and best source of traffic, they also offer targeted traffic. Targeted traffic is the type of traffic that gets on your website because you have something that they want. It could be that your site has the information, product or video that they are looking for. Sure, there are other methods to generate traffic like social media, but search engines will always remain to be the primary source. Because to this day, many people still use search engines to find what they need. There is a reason why “Googling” is an actual word used by people. Every time someone needs some information about a product/news and much more they hope over onto a search engine like Google. 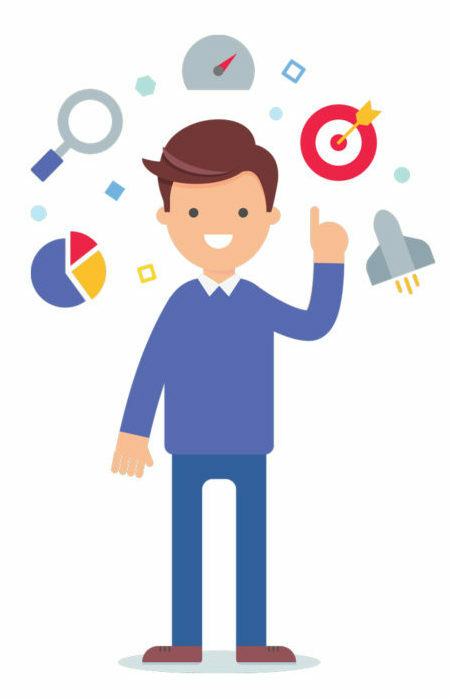 You need to use SEO to make sure that you show up as one of the top results when your target market searches for something related to your website. 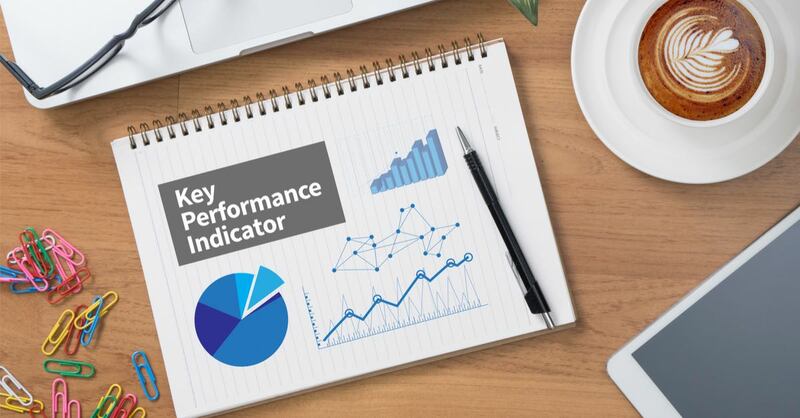 KPIs stands for Key Performance Indicator(s). These indicators help guide you on how close you are to achieving your objectives. As stated earlier, organic traffic is traffic that is not paid for. This is traffic coming straight from search engines as a result of good rankings. You can track the amount of organic traffic you’re receiving by using Google Analytics. They help you know what position/page your website is on in the search engine results pages. There are some tools that you can use to monitor the keywords that you’re targeting in the search engines. I personally use SEMrush and recommend it highly. Not only does it track your search engine position, it offers so much more. Click here to learn more about SEMrush. 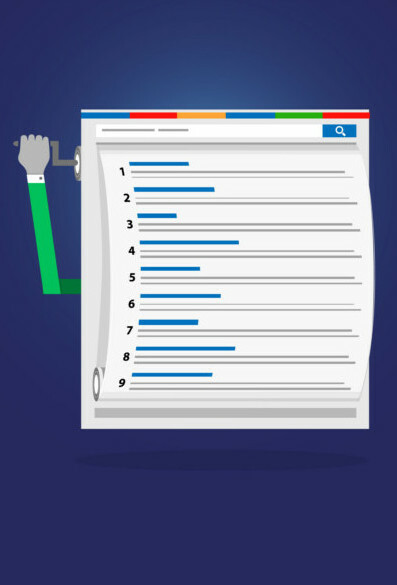 This is a search engine ranking score created by Moz (a popular SEO tool). This score is based off of many factors including how many backlinks your website has and the quality of the backlinks. The Domain Authority of your website can be used as a good indicator of the likelihood of your website ranking high in the search engines. The higher the DA of your website, the better. Leads are simply potential customers. These are people who might sign up for your service, newsletter, send an inquiry via a contact form or purchase something if you’re selling products or services on your website. You can track how well your organic traffic converts into leads by setting up goals in Google Analytics. These indicators can help you know how successful your SEO campaign is. The importance of a KPI will mostly depend on your goals. If you’re a business, then organic leads are going to be more important for you. For a blogger, the other metrics like organic traffic and keyword rankings will be more important. This is why it’s crucial that you, as a beginner, have an idea of what your goals are before embarking on SEO. It will help keep you level-headed and focused on what is important. You might have noticed that we mentioned a tool called Google Analytics. This is a powerful tool offered by Google to help you track important metrics. More on it later. We now need to look into keywords and the role they play in SEO. To understand all this, you need to understand how Google works. Google always aims at providing the best user experience possible. This is why it employs snippets and auto suggestions as part of the search experience. Google has a database of websites and it knows and understands the websites via the use of spiders (not the actual arachnids!). These spiders crawl the web getting information on different websites. To answer a search query typed in by a user, the search engine asks over 200 questions (some which are known are considered ranking factors). The websites that can answer most of these questions are displayed on the first page of Google. The sites are displayed in order of how many questions they can answer. You need to remember that all this is done in 1/8th of a second. This, of course, is a simple way of looking at how Google works. It’s actually more complex than this. You can’t achieve the rankings you need in SEO without Keywords. Keywords and SEO are somewhat synonymous. Anytime an expert talks about SEO, you’ll probably hear about keyword research as well. As a beginner, you need to understand that keyword research is what will determine whether you’re SEO strategy will succeed or fail. The keywords you choose to use will determine your level of success at gaining traffic. Don’t ever think of starting your website without doing keyword research as that’s a recipe for failure. The keywords that you target will help Google send the right traffic to your website. We’ll talk about keyword research more in depth in another chapter. The definition of long tail keywords differs depending on the expert that you ask. Some define long tail keywords as keywords with 4 or more words. Others define long tail keywords as keywords with low search volume and competition but related to your main keyword/topic. Long tail keywords exist because some users tend to type in phrases when searching instead of short words. Many long tail keywords tend to be long phrases as many people don’t optimize their content for them. Long tail keywords when found can be a gold mine that helps increase your traffic and rankings. They tend to have low competition, so it’s easy to rank on the first page for them. All you need to do is make sure that you provide good content that keeps your readers hooked and you could see a spike in traffic in the long run. Also, sprinkle some LSI keywords in the article. LSI stands for Latent Semantic Index, these keywords are normally synonyms or variations of the main keyword. Using this in your content could help you rank for many different search terms. Nothing can beat a well-optimized site. 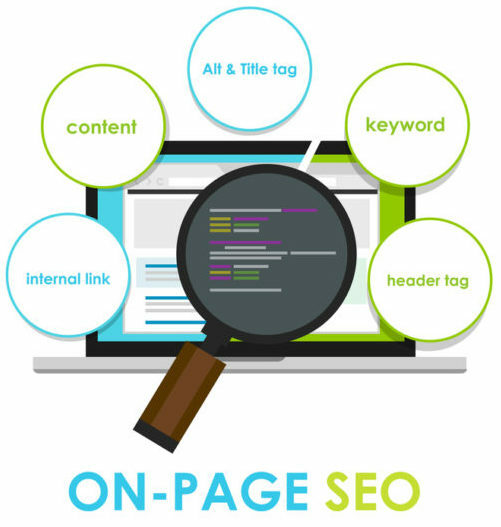 On-Page optimization is crucial for better rankings as it allows the robots to easily crawl your website. You can have many backlinks, but with poor optimization, you won’t rank high. It’s important to always make sure you follow all the rules of proper on page optimization if you want to be harder to beat in the rankings. We’ll talk more about it in the next section. There are a plethora of tools out there that can help you with SEO. One tool that’s a must-have for any WordPress site is Yoast SEO. This plugin helps guide you when creating pages and posts. It helps you make sure that they are properly optimized. And that’s just for on-page optimization. For keyword research and other SEO research, we use SEMrush and it really makes a difference. There are other tools like SEMrush too, like Moz, Ahrefs, and some other that are not used as much. Each tool has its own strengths and weaknesses, but one thing is true, these tools can ease your SEO efforts. The best SEO tools will provide you with all the data that you need to make an informed decision when performing keyword research. You’ll get details like the top 10 rankings for that keyword, the search trend, search volume, Keyword difficulty and much more. 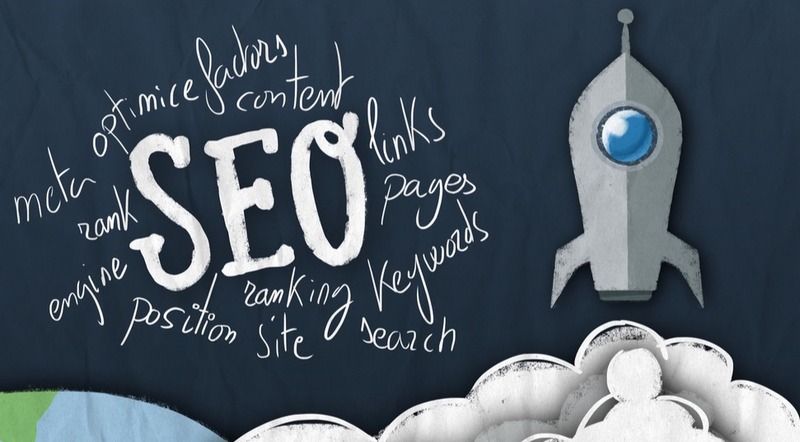 There are 2 key elements that you need to understand when implementing SEO on your website. 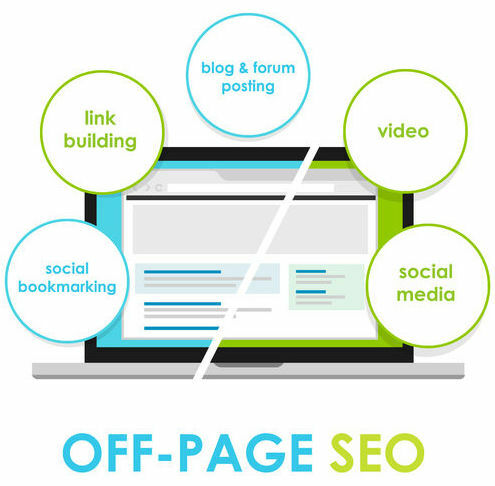 On-site/page SEO and Off-site/page SEO. This involves optimizing your website and its contents for the search engines. Proper on-page optimization will ensure you rank highly on search engines like Google and Bing. It will also ensure that you’re harder to beat as competition increases on the search term you’re ranking for. This aspect of SEO revolves around making the search engines trust your website. The main method right now is via building links (backlinks). You need to have authority sites referring you as one of the sources for their contents. This helps establish trust with the search engines as it shows that your content is relevant. If you want to achieve rankings quickly and more so in competitive search terms, you’re going to need to work on your link building. The more high-quality links, the better. Now that we understand On-Page and Off-page SEO, let’s have a look at some techniques that are used for each. Keyword research is the foundation for any good SEO strategy. If you want to gain traffic to your website, then you’re going to need to perform proper keyword research. We would argue that you shouldn’t even start developing your site if you haven’t identified your main keywords. Keyword research is like market research except it’s all done online. It’s through Keyword research that you’ll identify the main keywords to target that will help you gain more traffic. Before we begin, you need to understand that Keyword research and SEO as a whole is not only about gaining free traffic. Free traffic should be the end result of your strategy. The main goal is to always allow your potential reader/customer to easily find you online. Your aim is to meet the needs of your ideal reader/customer via your content. The first thing you need to do is to always identify your target audience or the main topic you want to focus on. Let’s be real here, your chances of success will be much lower if you choose to write for everybody. Not only will it be harder for you to rank. It will also be more difficult for you to set targets and focus. If you’re a blogger, it’s as simple as knowing your interests and what you want to write about. For instance, you’re a fan of technology. You could choose to write about technology in general or something more specific like mobile phones and PC. It’s different when you’re trying to run a business. In this scenario, it’s best to build a buyers persona. This is basically profiling who the ideal customer for your product/service would be. You come up with their age, interests, and behaviors among many other things. Having a buyer persona helps you come up with potential keywords that your customer might be using to look for you. As we stated earlier, there are many SEO tools available online. Each tool with its strength and weaknesses. You could use paid tools like Majestic, Ahrefs, and SEMrush to get your data or you could use free tools like the Google Keyword Planner to get the info you need as well. We always use SEMrush for all our SEO needs, It’s really helpful tool, give it a try. What’s important here is you get key metrics like the search volume and related keywords. Long Tail Keywords are the key to beating your competition and ranking higher especially with highly competitive search terms. Use an SEO tool to get as many long tail keywords as you can. It’s through these tools that you can find the gold mine of keywords that have both low search volume and low competition. Have an Excel sheet with 4 columns; Keyword, Monthly search volume, All in Title and KGR. Any keyword greater than 1 is highly competitive and harder to rank. Keywords in the range of 0.25-1 are semi-competitive while those below 0.25 are perfect. Using this method you can find great keywords that will be quick and easy to rank with. Now that you have an idea of your audience and keywords to target, you need to have to look at your competition. These are sites that are ranking well in your industry. A good SEO tool should help you with analyzing your competition, but not everyone has access to these tools. A free way of analyzing your competition is by using the free MozBar. It will give you stats on the Domain Authority, Page Authority and referring links. The referring links are basically backlinks to the site. The Page authority is a score that Moz assigns to a page based on many factors one of them being links. The higher these stats are for your competition, the harder they’ll be to beat and de-rank. This final one is for businesses that are looking to rank on Google. As a business owner, you shouldn’t just go for any keyword. You should also consider its commercial intent. Keywords that have commercial intent indicate that the searcher is looking to purchase a product rather than seek information on it. An example would be “buy sneakers”, “best shop for sneakers” among many others. These are the best keywords to target as a business as it gets you visitors that are looking to purchase what you have to offer. A point to note is you might have to do a bit of digging to find the right keyword. This is because many keywords with commercial intent tend to be highly competitive. 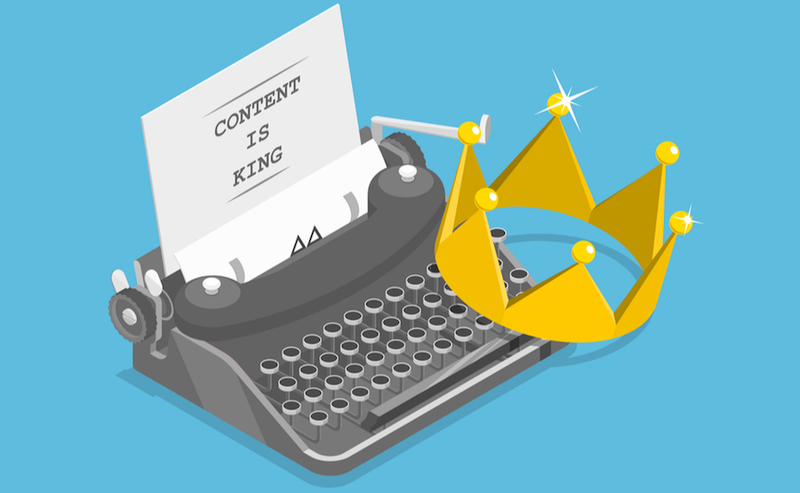 You might have heard the phrase “content is king”. This phrase implies that content is one of the key things to focus on. We agree with that. Without proper content on your site, you won’t succeed. Google is the largest search engine in the world, you already know that! What you might not know is Google wants to provide users with the most relevant and useful information possible. This is why they keep tweaking their algorithms. The Title – Be sure to use a good and attractive title that attracts the interests of your readers. The title is your first impression, make it count! There are some tools that you can use to gauge the quality of your titles. Up to date content – The content you provide should be up to date. Don’t rehash content that’s not relevant to the current times. A good strategy that you could employ is to use Evergreen content. Evergreen content is content that never gets outdated. For instance, many articles that offer an answer to a particular question or even how to guides tend to be evergreen. 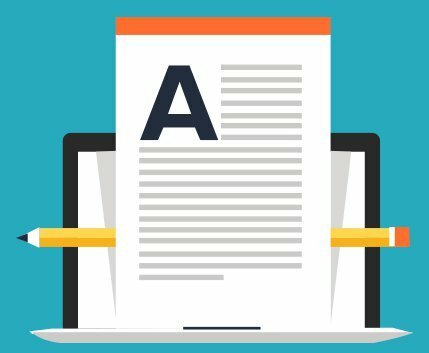 Quality – The key to a quality article is to make it unique, have minimal grammar errors and make it readable. You make an article unique by covering a certain topic/aspect of the topic that many other articles online haven’t covered. This will provide you even more visitors as people will flock to get the new information. Your content won’t be useful unless its readable and has minimal grammar errors. Make sure you reduce grammatical errors within your articles. On top of that, make it readable by using shorter paragraphs, short sentences and by using less complex words. There are also tools that can help you assess the readability level of your article. Keywords – Once you have the keywords that you’d like to use. You need to properly place them within the article. You need to place them in all the right places to make your content SEO optimized. We’ll talk about that in a few minutes. Links – Don’t forget to include links in your articles. There are two types of links. Outbound and Internal links. Internal Links are links from within your website. It’s when one page on a website links to another page on the same website. Internal links help with the link structure which helps the spiders to easily crawl your website. On the other hand, outbound links are links from one page on a site to another page on a completely different website. Outbound links are useful for SEO, but also building relationships with other webmasters. It helps encourage other website owners to link back to your website. Here is where on-page SEO takes precedent. The manner in which you format your content is important for both search engines and visitors. In any given content you write, there will be headings and subheadings. You need to make sure that they are properly optimized for the search engines. By using heading tags like <h1></h1>, <h2></h2> , <h3></h3> and so on. The main heading gets the H1 tag, the subheading gets the H2 tag and the heading below the subheading gets the H3 tag and so on and so forth. Optimizing your articles with these tags help the search engines understand what the main topic is about and how the content is styled. Doing this can even help get a preview snippet on Google’s SERP. You also need to add the keyword at the beginning of the H1 tag. Try to make sure that the keyword fits there naturally so that the title reads well. Remember you’re writing for people too and you want them to understand what you’re writing. A tip; use the double dip technique recommended by Brian Dean from Backlinko. It involves including a short tail keyword and long tail keyword in your main title. By doing this, you’re increasing the likelihood to rank for the long tail keywords. You also need to optimize the URL of the page. Avoid using ugly URLs that contain random numbers and letters. Instead, make your URL is short and try to include your main keyword. This is not a big ranking factor, but it does help add up the points. We’ll be quick to point out that Google has flatly stated that the meta title and meta descriptions are not ranking factors anymore. With that said, the Click Through Rate (CTR) is definitely something that the algorithm looks at. The more people click through to view a web page, the more Google thinks the page is relevant and the higher it ranks the page. One of the ways to improve your CTR is by including a catchy meta title and meta description. Using call to actions in the meta description. Call to Actions like “Read More” and “Learn More” could persuade people to click on your website. 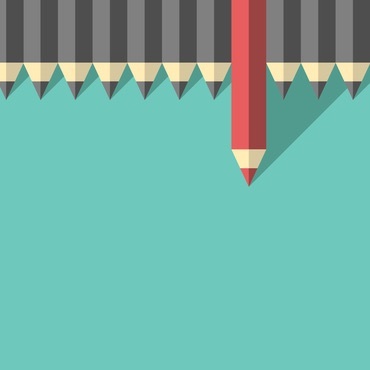 Write unique and relevant content. Don’t copy and paste meta descriptions. Instead, write unique ones that are relevant to the content you’re providing. You’ll be surprised at how much of a difference that can have. Include Catchy descriptions in your Meta Title. Always include a catchy description in your meta title. It helps users understand what your content is about. For instance; we could say “How to Increase Traffic Using SEO in 2019” as our meta title. 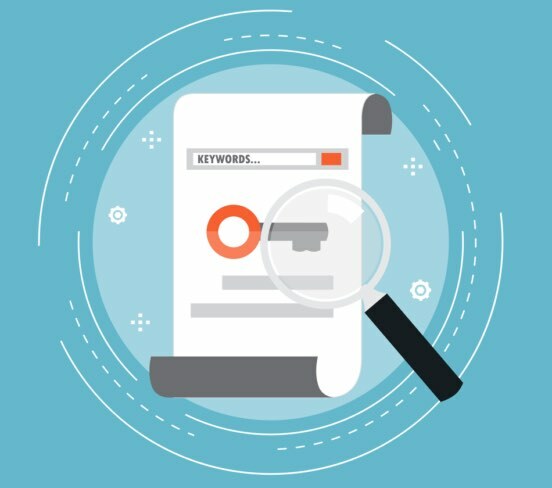 As we have stated previously, Keywords are the key to a successful SEO strategy. There is no point to doing all that research if you’re not going to use the keywords you have. You should maintain a keyword density of 3% at most in every article you write. A higher keyword density could lead to overstuffing which is not good for ranking. Always use the keywords in the main title, at least once in a subheading and in the first 100 words of the article. You can optimize the images on your site by using Alt tags and reducing the image size. Lower image size ensures your website loads faster. The Alt tags help the search engines understand the images being displayed. They are also used by the visually impaired surfing the web. Here’s where we’ll give you another tip, Long content performs better in the SERPs. Because longer (and interesting) content makes the users stay on your site longer. This signals to Google that your site is relevant and provides useful information. On top of that, the search engines consider longer content to have more information and that they cover a topic in depth. A technique you could use here is the Skyscraper technique provided by Brian Dean of Backlinko. In this technique, you research the best content for your keyword on the search pages. Once found, provide a more in-depth article with even longer length than it. This method has been shown to work for many people with increased ranking and traffic being a side effect. In this section, we’re going to focus on the website itself. You need to make your website easy to navigate. You can do this via a proper internal linking structure in your article. This can also be done by using clear and visible navigation menus that help the user move around the site. You can also use breadcrumbs if your site is large. Categories can also help guide the user. Always add categories relevant to the content. Don’t make your website about technology and have a category about Football. You’ll be setting yourself up for failure. You need to make the website mobile responsive. This is key considering the growing number of mobile phone users. More people are now increasingly surfing the web using their phones. You’ll be losing a huge chunk of traffic if your website is not mobile ready. Yes, website speed is a major ranking factor for Google. If your site takes too long to load, forget ranking on the first page. As we have emphasized, Google wants to provide the best user experience to all its visitors. Websites that take too long to load go against that. The industry average for website load time is 6 seconds. Any longer than that is not good. Getting a good web host, a good theme and optimizing your images should help keep your load times low. So make sure to spend some time optimizing your website for load times. There are two types of links; Outbound and Internal links. We have already talked about them earlier in the article. A good linking structure can ensure your site ranks well on Google and is an important aspect of On-page SEO. You should always link to other pages and blog posts in your article. It helps the spiders crawl your website faster and easily. This might lead to quicker indexing and even higher rankings on Google. Outbound links should always be relevant to the content that you provide. The search engine uses these links as a relevancy signal to understand the topic of your post. Always be sure to include them. You guest post when you publish an article on someone else’s blog. 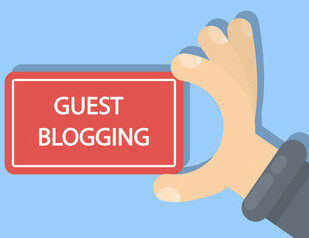 Guest posting can be a great tool to drive traffic and increase the domain authority of your website. In order to offer a guest post, you first need to find a blog that accepts posts from external authors. You also need to be selective with the sites you choose to write for. A criteria you can use is Domain Authority (DA) and Page Authority (PA). Always make sure that the blog you write for has a high DA and PA. A link back from these websites could make a huge difference to your rankings. You can find sites that accept guest posts by typing “ Your Niche + Write for us” or “Your Niche + Guest posting” in Google. For instance, if your niche is on technology, you’ll type “Technology + Write for us” in the search engine. It’s always important that you build a relationship with the editor/author/owner of the site before reaching out for a guest post opportunity. You can do this by leaving thoughtful comments on their post, sharing their posts on social media and liking their content. Doing this increases your chance of getting accepted when you pitch your post idea. This is not easy depending on the niche you’re in, but providing unique content will always generate backlinks. For instance, this article contains links to other sites. We linked to them because we valued their content and found them to be experts on their respective subject matters. The owners of the sites didn’t contact us, we chose to voluntarily link to them. Creating unique and quality content that covers a topic in depth will always bring about natural backlinks to your site. You won’t need to ask or negotiate, they’ll just come. With that said, this method isn’t 100% foolproof. It mostly works for the more established websites as they already have visibility on their posts and an engaged audience as well. Blog commenting used to be an easy way of generating backlinks, but not as much anymore. This is because many sites have made the links back to other websites from comments as Nofollow links. These links don’t pass any link juice from one website to the other. With that said, it’s a useful Off-page SEO technique. This is because it helps generate relationships with other bloggers. On top of that, it does diversify your link portfolio. This is good as it helps avoid penalties from Google’s Algorithms. Go for Blogs that are relevant to your niche; Commenting on a blog that’s different from your niche won’t add value to your site. Any potential visitors would be dissuaded once they land on your site because you’ll be in a different niche than what they expected. Make Thoughtful comments; Don’t provide generic comments like “Nice post” or “Thank You”. It just shows the author that you never read the post. It also won’t help you stand out and build meaningful relationships. Social Bookmarking sites are sites similar to social media ones except users post contents on different subject matters and interact rather than seeking to connect and make friendships. A good example of social bookmarking sites are Stumbleupon, Reddit and Medium. These types of sites allow you to post links back to your site as long as you’re not spammy. They can be a great way to generate a loyal following and to increase exposure to your site. One thing you need to take note of is that the users on these sites don’t take kindly to people looking to build links. Do not post your link unless what your posting is relevant to the content being discussed. Unnecessarily promote your site and you’ll find yourself downvoted to oblivion. We don’t need to tell you that social media sites like Facebook and LinkedIn have tons of users. Posting your site on social media can be a great way to promote your post to the masses. In all honesty, it’s not just as easy as posting on social media. You also need to promote it further. even other social media profiles. All this can let your friends and fans know more about you. You can also interact with groups, pages and other people operating in your niche. Provide relevant content and answer questions on groups without self promotion. 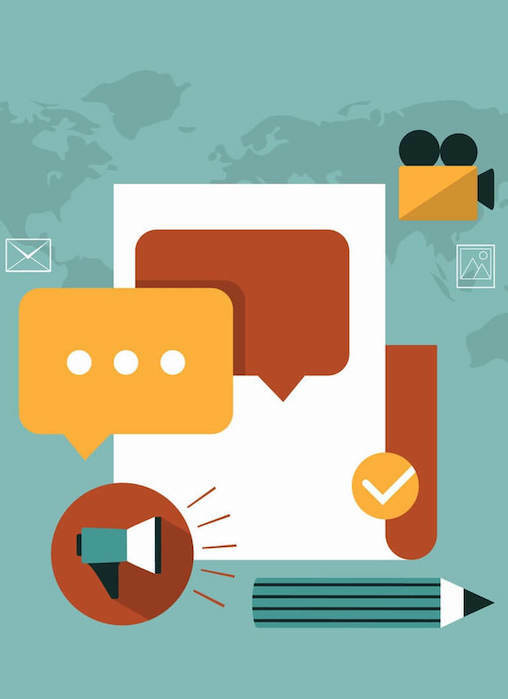 Doing all this can help promote your content seamlessly as your profile gains more exposure. Building relationships with other bloggers also does come in handy. They can promote your post to their followers and increase your reach. Quora is a platform with a growing user base. Users interact with each other on a question-answer basis. One user posts a question and others come along and post answers to the question. The format of Quora has grown popular as more people from all over the world join the site. What you can do to use Quora to your advantage is to add your blog link in the profile bio. On top of that, you can subscribe to topics in your niche to see them in your feed. To gain more followers you need to answer relevant questions with thoughtful answers. The aim here is to establish yourself as an expert in your niche. You can also include links to your blogs in answers when needed or necessary. Never over promote yourself. Like Reddit, too much promotion will get your answers downvoted and even reported to the site. This could lead to you getting kicked out of the platform. This might be a lot of information to process at once and we can’t blame you it’s a lot! Take your time, go through it and learn the fundamentals of SEO. SEO is a huge open space. What we have covered is probably only half of what you need to know. We have mostly looked at SEO and how it can help you gain traffic. There is a lot more to it than that. The next step for you should be to take action today! All this information that you got will only be useful if you actually implement it. Go put this beginners guide into action! Get back to us in case you have any questions. We’re always here to help. pretty axhaustive detail like backlinko, i have seen strategist always talk negative about paid ad. but , in india it works…remember zomato and myntra stories? they all started with digital marketting..i still have some hope in paid ads for initial branding. I’m glad you liked it. And yes, I agree with you. Some businesses can benefit greatly with Paid ads, but for beginner bloggers or web developers, SEO can provide long-term benefits without much investment.